Our premiere concert stars Jenny Burton and Julia Wade and the music of Peter Link with a wonderful ensemble of featured performers. 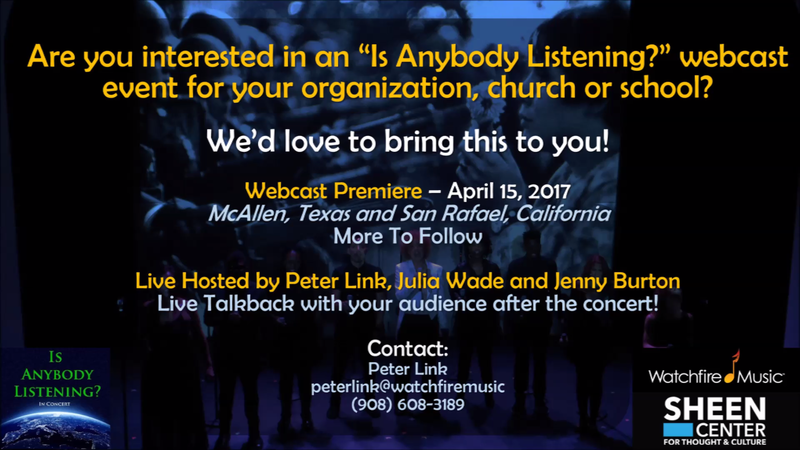 We can bring you our live web-hosted concerts, drawing from our multimedia catalogue, and customizable content for large and small groups. For an inspiring evening with friends and associates or a powerful benefit fund raiser for your organization reaching around the world. Are you interested in finding out more about the power of “Is Anybody Listening?” as a most effective Fund Raising Benefit for your organization? The project was developed in house at the Sheen Center, NYC and Link Recording Studios and is producing a library of interchangeable video songs. These will address a number of issues and can be re-purposed at will to fit the needs of organizations around the world. They would be presented through live performance, webcasts and video streaming to the following audience. Want to find out more and get involved?